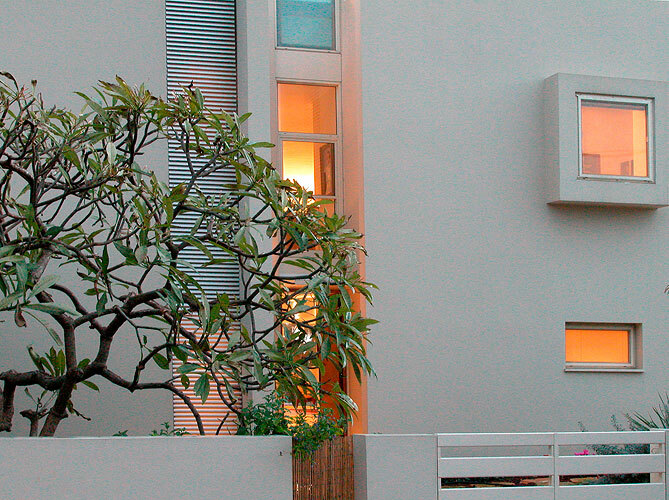 The house is located in the heart of one of the oldest neighborhoods in Ramat HaSharon. The monolithic volume is organized on the site in two floors, and from a distance looks like a box which was planted on the land. The spatial complexity, large openings and light sources were designed as reactions to the large trees which the owners had planted more then twenty years ago. The garden trees create an interior/ exterior relationship with the new house. Interlocking views between the floors create a sense of unity between all parts of the hose. The programmatic superimposition in the private and public utilizes the combination of interior and exterior. The closed façade which is facing the street protects the villa's spaces, whereas, a white construction opens up towards the view of the strawberry fields.